The town of Banff Canada has a very unique setting: The mighty Bow River winds through the town; Massive tall, majestic snow-capped mountains surround the town. Mt. Rundle, a finlike mountain, stands to the south. Mt. Cascade, exposing its glacial face at every corner, rises up immediately north of downtown. The photo below is taken from the Cascade Garden, it shows Banff Avenue stretching quite perfectly toward the base of Cascade Mountain. While you stand at middle of the town of Banff Canada, you will amazed to see craggy peaks fill the sky in every direction. The map of Banff will help you getting around the town and finding the local attractions and some hiking trails. The town of Banff Canada also abounds with opportunities to experience everything: from the most rugged of outdoor activities to world-class arts and culture displays. Paddle a canoe or kayak along the river; hike or bike a mountain trail and drink or dine in the view. After a day of outdoor adventure, the area's restaurants, bars, spas, shops, hotels and attractions will provide recreational adventures of a different kind. Down the main street in the town of Banff you will find several gift stores that have amazing artwork on display. These were created by aboriginal artists which are a very important part of the heritage of this town. You will feel like you walking in museum when you browse around the gemstone / fossils stores on the main street. 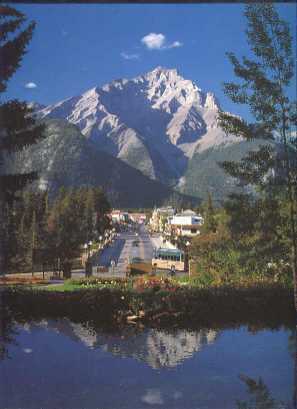 Summer in Banff offers many activities such as hiking, camping, fishing, golfing, canoeing, and kayaking. In Winter, Banff is one of the best places in North America to ski, snowboard, toboggan or snowshoe or try an experience of a lifetime and dog sled in the mountain wilderness. Banff is an amazing place to enjoy some well deserved relaxing time and explore the beauty of Alberta.